Linda Hachey’s heart sank when the phone rang at 2 a.m. on March 18. Hachey arrived to find her son, 29-year-old Nicolas Andali, intubated and unconscious. She was urged by the nurses to speak to him. “Studies show that maybe they can still hear you, but just can’t respond,” Hachey recalled. “So I did, I talked to him. 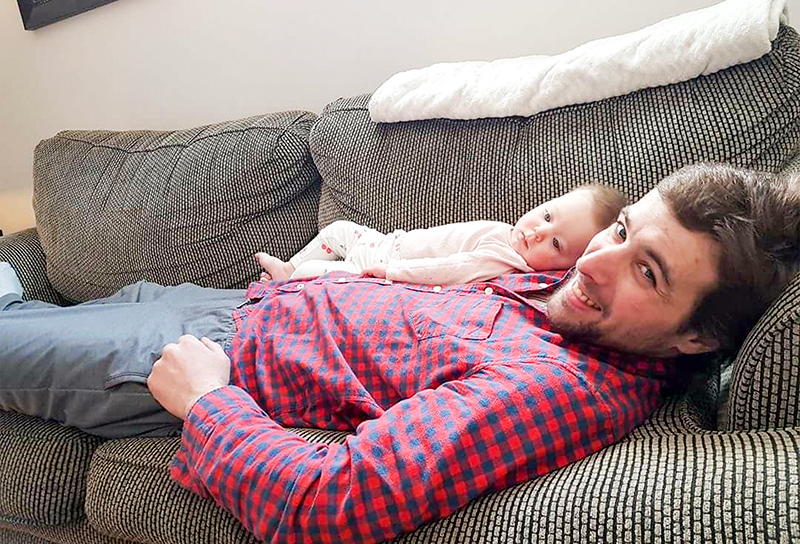 Andali was struck by a vehicle while walking home on Lakeshore Road around 1:30 a.m. His body, discovered by a cab driver, suffered trauma to the brain and spleen. A shoulder blade and rib were broken, and bruises and lacerations covered his body, including what his mother describes as a ‘road rash’ that resulted from the collision. A 20-year-old city man turned himself in to Sarnia Police 32 hours after the collision, which occurred in the 1700 block of Lakeshore. Boady Santavy was charged with failing to remain at the scene of an accident and released on a promise to appear. A world-class weightlifter, Santavy is currently in Australia representing Canada at the Commonwealth Games, where he placed second in the men’s 94-kilogram division, Sunday. Andali was initially listed in critical condition. After four days in Intensive Care and Trauma Observation units at London hospital, the former apprentice mechanic is now living at home with his mother, where a hospital bed, railings and other accessible accommodations have been installed. Because of his sensitivity to light and noise, Andali has been set up in the basement. During the day, Hachey helps bathe him, takes him for walks in a wheelchair, and drives to London for follow-up appointments. At night, she sleeps on a loveseat next to him. She hears every movement, and painful groan, and the worst part — every nightmare. “There’s times when he jolts up in the night — covered in sweat — and that’s not good for his body,” Hachey says. Andali doesn’t talk about the incident and struggles with memory and concentration, Hachey said, noting the trauma team advised no television or screen time. He’s fortunate to have a large, supportive family, she added, but tries to keep visitors to a minimum, because the voices and stimulation can be too overwhelming. Easter dinner, for example, was just too much. A Go Fund Me page (www.gofundme.com/justice-for-nicolas) has been set up to help with costs, particularly for Hachey, who has stopped working to care for her son full-time. Hachey said it’s unknown when or if Andali will return to work. “He was always mechanically inclined, even as a kid,” Hachey said of her son, who worked for his uncle at Precision Power Sports. “He loves all that stuff — Sea-Doos, snowmobiles, motors, rollercoasters. “He’s a straightforward guy,” she said with a little laugh. “He’s a sweetheart, but he’ll tell you if you’re a jerk. Hachey said she’s overwhelmed by the community’s support but worries about what lies ahead. Sarnia Police are asking anyone with information about the collision to contact Const. Jim Maginn at 519-344-8861, ext. 6152.